How many times a day do YOUR staff either call IT or ask a colleague to help with a basic computer related issue? How much time and money could you save if there was another way? Let us help you train your employees so they learn what they need to know, when they need IT. Boost productivity. Improve people’s confidence to do the job right. Free more time for higher- priority work. Ultimately… save time and make your business more money. We deliver IT Training for you and your people whether it’s PC or MAC, from elementary topics to more advanced support. Premium quality service geared to your needs and budget with a clear focus on ROI for you. Our fully-qualified trainers deliver expertise in a friendly, fun and engaging way. Just a few hours IT Training could make a huge difference to your profits, productivity and employee retention rates. Shelley Fishel has written a book about Excel – set in a coffee shop, join Matt and Lisa and learn Excel and how they use it in their business. You can get your copy of the book here. It is available in paperback or on Kindle. Call us now to find out how we improve the performance of your staff. Call us now on 020 8203 1774 and we can find the best way to help you train your team. Select from a range of Microsoft Courses that will Improve Your Performance. 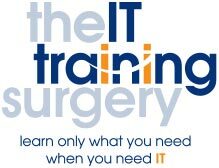 Would you like to talk through your IT Training needs? Just send through your details and we'll get back to you.